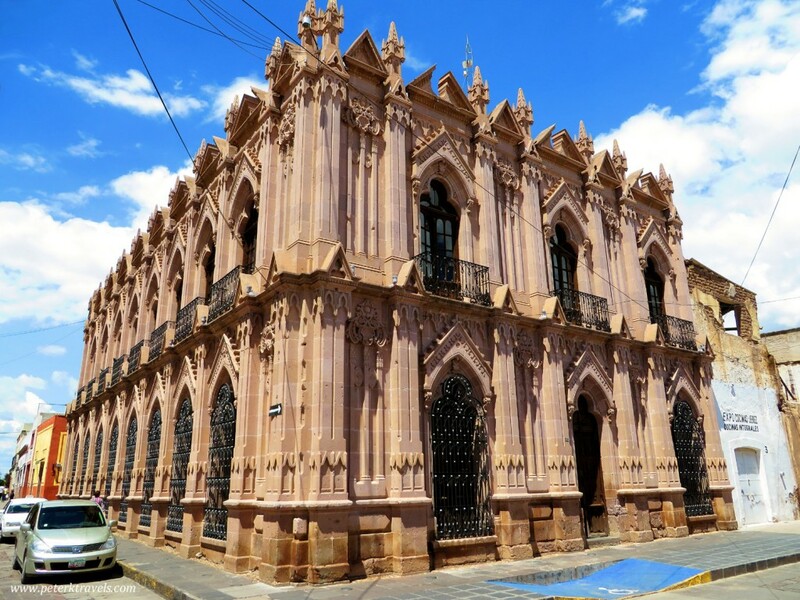 In July 2013, I visited the Mexican city of Zacatecas with my wife. 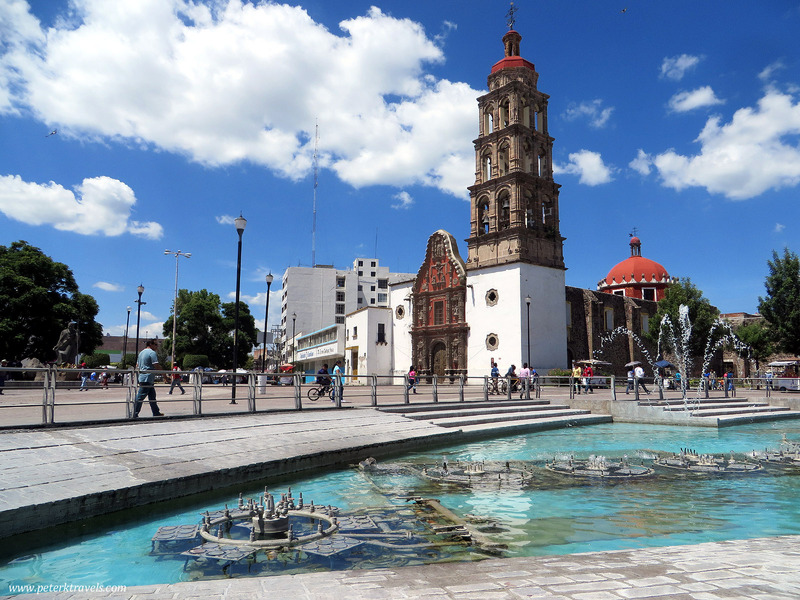 While there, we took a day trip to the city of Jerez De García Salinas. 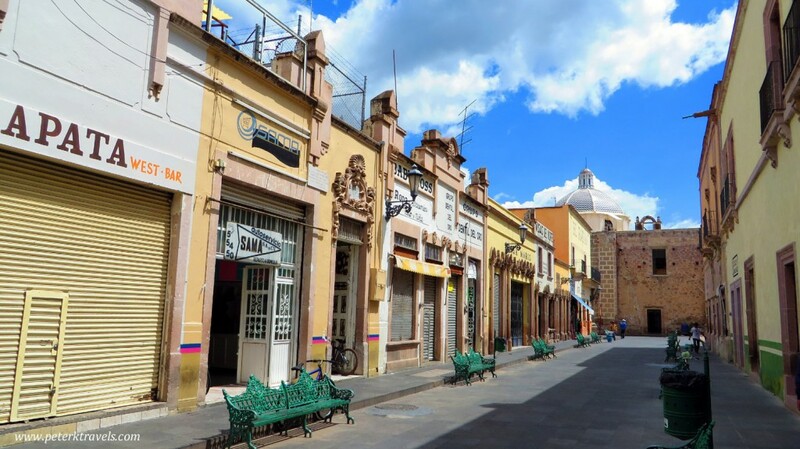 Jerez is one of Mexico’s Pueblos Magicos — towns highlighted by the Mexican Department of Tourism for having magical natural, cultural, or historical significance. 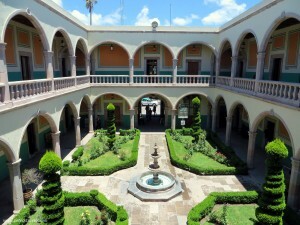 To get to Jerez, we took a cab to the very modern, nice, bus station in Zacatecas. Once there, I purchased tickets from Omnibus de Mexico for their next bus to Jerez. The ticket cost 50 pesos each way (~$4 US). This bus was a nice, first class bus that was going on to Guadalajara. 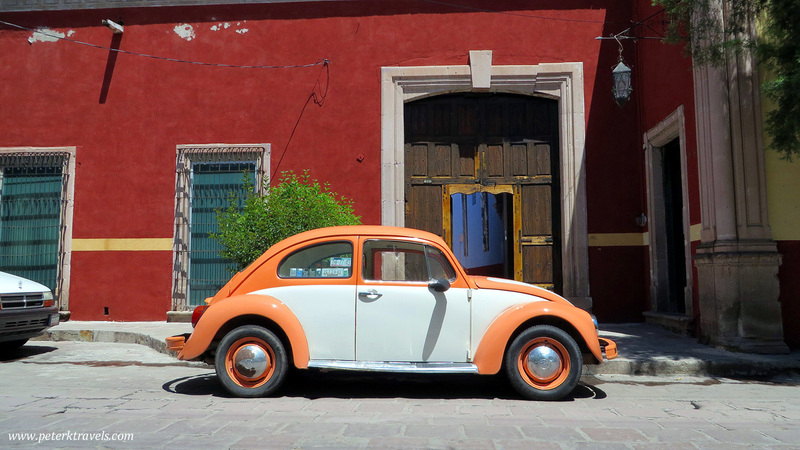 The time from Zacatecas to Jerez was only about 50 minutes. Once we arrived in Jerez, we took a cab to the downtown. 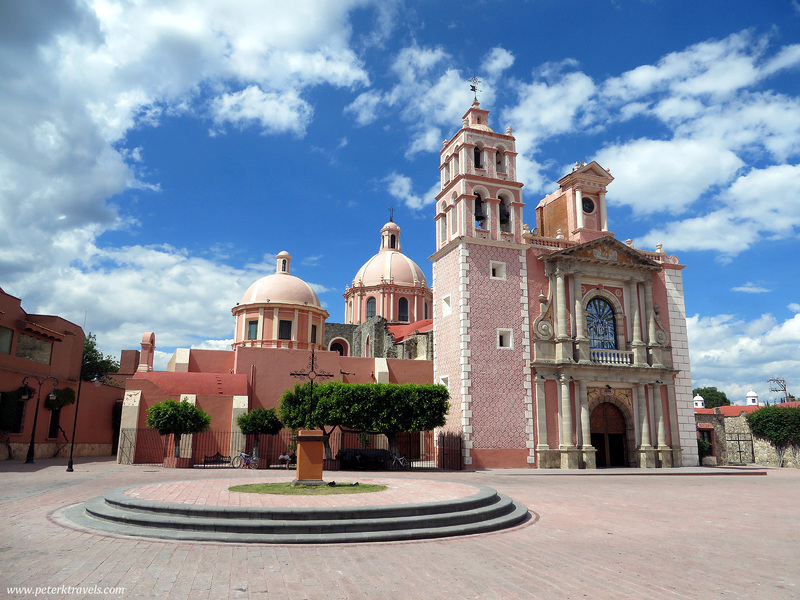 I instructed the cab driver to leave us at the Santuario Soledad, a large church which I could tell from my map was right downtown. Prior to the trip, I had tried to find a tourist map of Jerez without much luck. I had resorted to printing off a few Google maps, and highlighting places of interest on them. I usually look at satellite photos and try and find churches and parks, which are easy to spot from above. Knowing where these landmarks are helped to orient me. 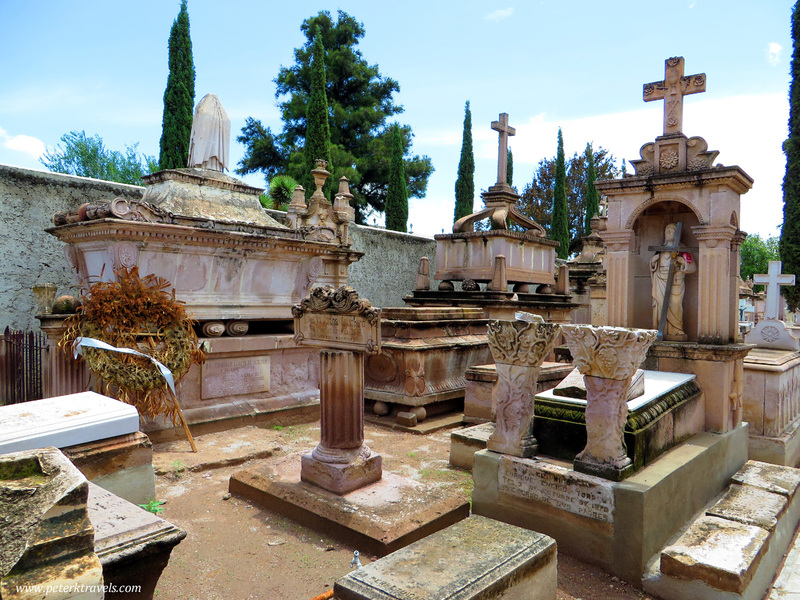 I had also noticed a large cemetery to check out. The Santuario de Nuestra Senora de Soledad is a beautiful church. Construction began in 1805, and the church was dedicated in 1818. It is one of two very nice churches in Jerez. Behind it is a very nice park, the Jardin Hidalgo. 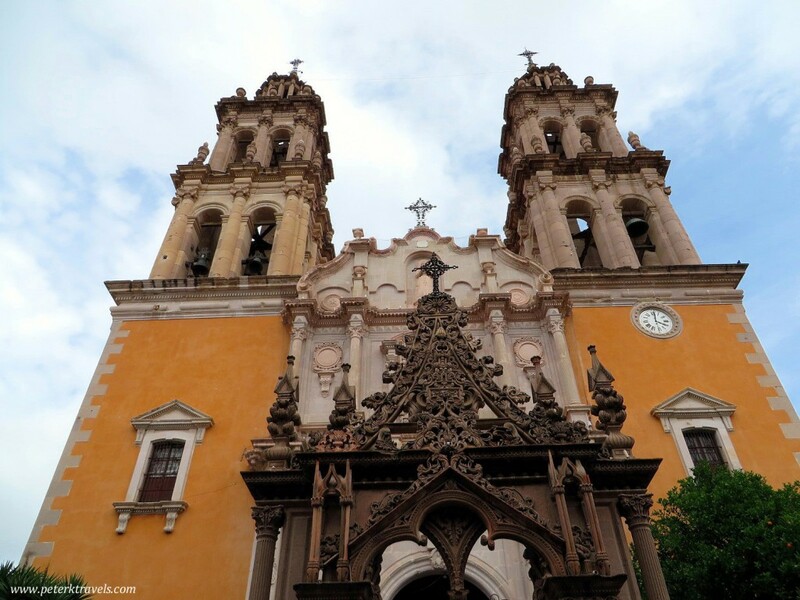 After spending some time photographing the church, we then walked just a couple of blocks to the east, where we saw the Parroquia de la Inmaculada. 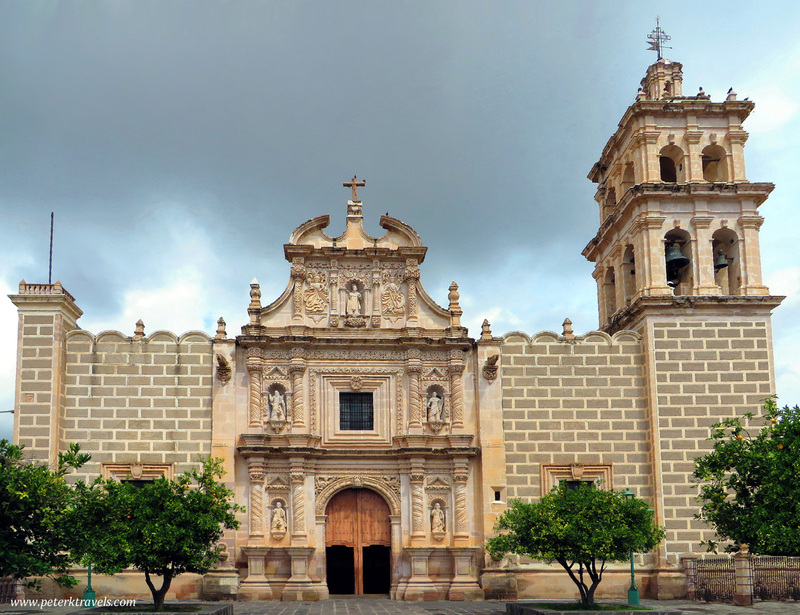 The Parroquia de la Inmaculada was constructed from 1727-1754. While I didn’t find the outside as interesting as the Soledad church, the interior was clearly superior. It featured many gilded columns, and some large murals. 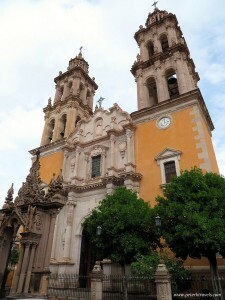 The Parroquia faced a small plaza, which had orange trees and places to sit. The church has a somewhat off kilter appearance, with only one tower. Perhaps they intended to build the second one and never got around to it (this is somewhat common). After visiting the two churches, we took some time out for a bite to eat. We had a nice meal of eggs, beans, and chilaquiles at the El Tarro Cafe, which sat on the main square, Jardin Rafael Paez. The waiter was kind enough give us a map of the town, which illustrates one point about Jerez: everyone was ridiculously friendly there. I’ve been to a few Pueblos Magicos in the past where people would barely give you the time of day. Jerez was quite different, being very friendly and welcoming to tourists. After lunch, we headed to the cemetery. After the cemetery, we then walked back to the main square area, for some shopping and more sight seeing. 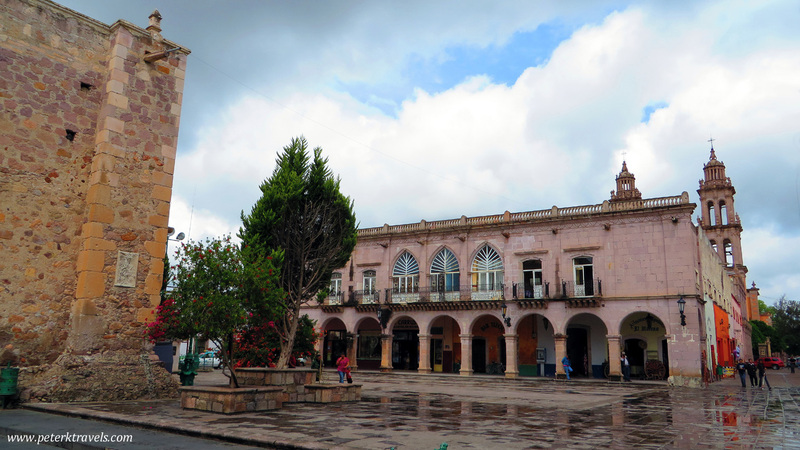 On one end of the main square stands the Presidencia Municipal. This is your typical municipal building, dating from the 18th century, but renovated in the 20th century. We were able to walk in and enjoy the courtyard and views. There were also some nice murals in the staircases headed to the second floor. We had hoped to get a view of the garden across the street, but the offices facing that way were not open to the public. 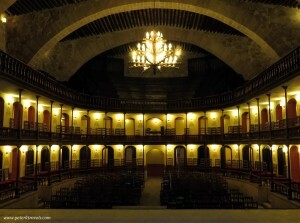 I also walked to the city theater, the Teatro Hinojosa. Dating from 1867, the theater didn’t look like much from the outside. A man was doing some light cleaning in the lobby, and he took me inside the theater. Before I knew it, he was turning on all the lights, including the chandelier, and taking me up on stage to get the best view (did I mention the people here were extremely friendly?) I was able to get some nice pictures, and really enjoyed the ad-hoc tour that I was given. I’m attaching some other photos from Jerez, mostly of street scenes and a few other landmark buildings. I found this to be a delightful place, and ended up wishing we had more time to spend there. I would certainly recommend anyone in the area stop by and enjoy Jerez! Please click the photos for larger images. 8 Responses to "A Daytrip to Jerez De García Salinas"
I like the blog better than just the photos. For example, I would have never noticed the fact that there was just one tower. I had already decided it wasn’t as interesting as the first church… not my favorite yellow color. But to know that they had a habit of not finishing was interesting. What did you buy in Jerez? I love to see the art that you buy. I just enjoyed all the pictures it was like a tour of the town! All the blogs just gave everything a more interesting meaning . My grandmother was born here so I wish to visit but this was like being there my self!! thank you! I’m glad you enjoyed the photos. Jerez is a beautiful town with friendly people and hopefully you’ll get to visit someday. Thank you for the beautiful photos. I haven’t seen them all, but your site came up when I googled for information on busing from Zacatecas to Jerez. I am in the midst of doing my research for a trip to Jerez this fall. I am glad to hear the village is so friendly, and I agree with you not all Pueblo Magicos are. 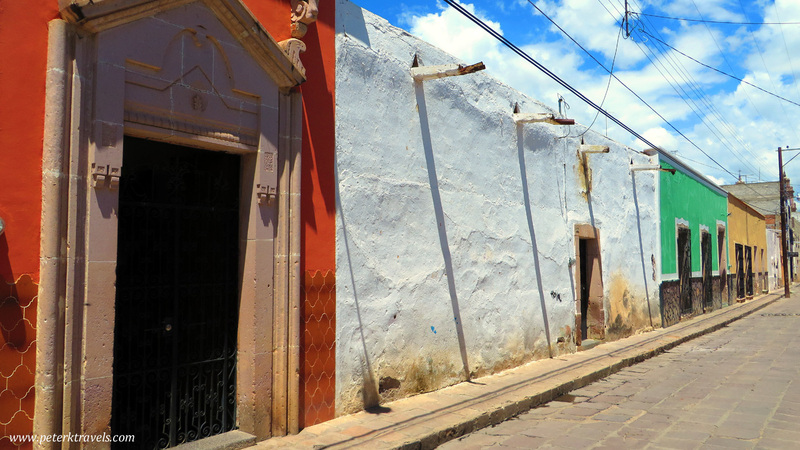 That was a disappointing factor in San Miguel de Allende, unfortunately. 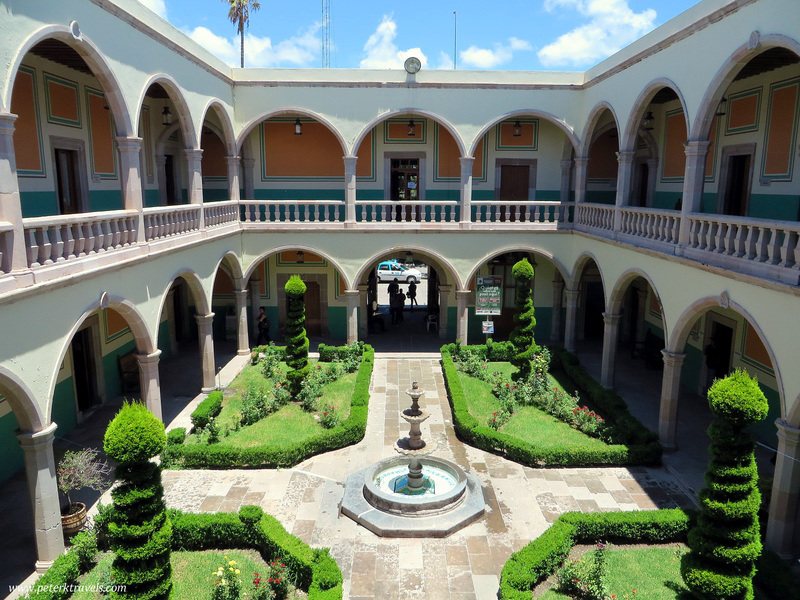 On a day trip to Dolores Hidalgo, however, we were totally surprised at the gracious older gentleman who, despite our faltering Spanish, insisted on helping us find the museum. It turned out to be right behind us! Thanks again, and may the Bird of Paradise always sing for you on your travels! I hope you enjoy your trip. It’s been a few years now since I’ve been there, and I’d like to return. I am originally from Africa but live in Los Angeles,CA! One of my best friend used to live here but now in LA…decided to take me to Jerez,zac. Yes this place is magical. I don’t speak Spanish but everyone was super friendly and patient with me especially when ordering a meal from the menu! My friend was my translator and I also used the app..iTranslate! Yes if you plan to visit here make sure you hit all those major spots mentioned! What a great travel blog! I’ve recently been doing genealogy research and have found a good deal of family from Jerez. I’ve seen many baptism and marriage records from both of these churches from 18th and 19th century. This blog has helped me decide on making a trip to Jerez de Garcia Salinas. Thank you! I was excited to come across this blog! I’m also researching our genealogy and came to this site by searching on the baptism records for the Parroquia de La Inmaculada in Jerez, Zacatecas. What a lovely site, thank you for all the great information.